Compare great deals online today! Other New York Airport shuttle, taxi, and car service. Flying out of LGA and looking for a LaGuardia Airport transportation to take you to and from the airport? If you are, you’re in the right place. We work with Super Shuttle LaGuardia Airport and other leading shuttle operators to provide you with the very best in terms of both service and price. It’s really easy to reserve your journey through our website and we guarantee that we’ll meet your reservation, or else your next journey is on us. Our service is ideal for anybody looking for Super Shuttle LGA services and, whether you’re after a one way or return trip, we’re sure to be able to meet your needs. So, if you want a LGA Airport shuttle service that’s reliable, cost effective and tailored to you, reserve your journey through our website today. Directions to LGA: Try out Mapquest, we find it works very well for Airport directions. La Guardia Rd and 94th St.
Basically they are minivan like vehicles that seat 7-15 passengers plus luggage. Typically shuttles, like Super Shuttle, offer door-to-door service, where you pick are picked up at ground transportation and then dropped off at your destination address, could be your home, office or a hotel. LGA has several shared ride shuttle services, SuperShuttle LGA being the most popular. 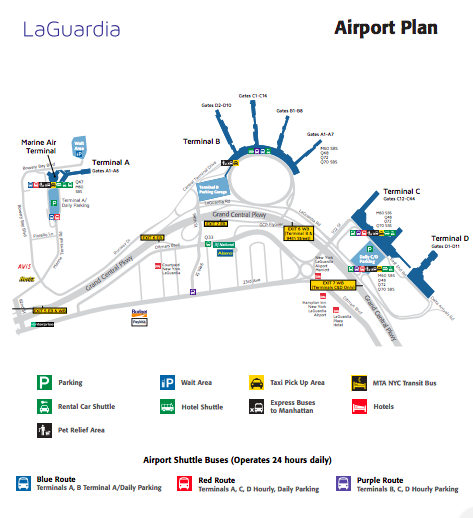 Super Shuttle LGA: Enter in a Pickup Location “LaGuardia Airport,” and a Drop-off Locaton “An address or even a hotel e.g. Grand Hyatt, New York. IMPORTANT NOTE: Super Shuttle in general have more van available and thus the wait time is less than Airlink NYC. GO Airlink NYC: Reserve your ride by Selecting your Pickup from and Drop-off at and your Flight date and time. Should only take about 2 minutes to book. Collect your luggage from baggage claim look for signs to our Welcome Center, located on the baggage claim level at each terminal. In the event the counter is unmanned, there are self-serve Kiosks in the same area by which you can arrange a shared ride or car service. Uber and Lyft at LaGuardia can also be used and they will pickup passengers in the Terminal B parking garage at Level 2. Best way to find it is follow signs on the departure level and proceed to the Terminal B parking garage. In terms of determining which shared van to get in, Super Shuttle is a Blue Van and clearly says SuperShuttle on it, whereas, GO Airlink NYC is a white van with green lettering. The wait for the van typically ranges anywhere from 20 – 40 minutes since they try to fill-up the vans before departing LGA. In case of both vendors, their driver will help load your bags into the van. The will probably ask where you’re headed, so kindly let them know. Enjoy the ride, once you arrive your driver will let you know. IMPORTANT NOTE: Please tip the driver (generally $1 – $2 per bag). LGA Taxi can take you to places in Manhattan, such as, Penn Station, Grand Central, Upper East Side and of course Time Square.